← Will E-Gate curb suburban sprawl? Could Yarra Boulevard be a ‘Bicycle Boulevard’? The State Government could strike a blow for cycling in this city if it were to declare Yarra Boulevard at Kew a ‘Bicycle Boulevard’. This road is currently used by a range of recreational cyclists for riding and occasionally by some clubs for competitions. 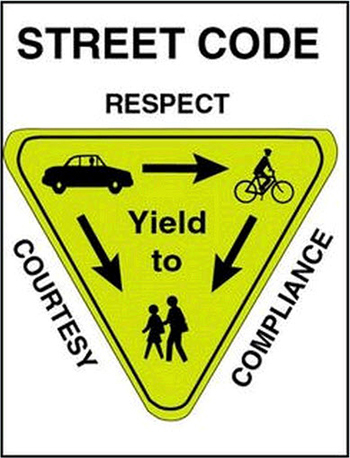 Although it doesn’t have heavy traffic there are enough cars and motorcycles to create a hazard for those on bicycles. Drivers expect cyclists to ride single file within the marked lanes on the edge of the Boulevard. However this is difficult because of the number of cyclists using the road and the need to move onto the road proper (the ‘car lane’) to overtake slower riders. The bicycle lane is also rough with lots of gravel washed off the cliffs on the non river side. At the moment, motorists ‘own’ Yarra Boulevard and ‘suffer’ the presence of cyclists. What I’m proposing is a reversal of that onus – cyclists would be the natural ‘owners’ of Yarra Boulevard and drivers would be required to behave as their ‘guests’. I’m not sure if there might be legal issues involved with the concept of a bicycle route where cyclists have priority but if there are they need to be addressed. That would be an institutional investment – it’s likely that there will be increasing demand for these sorts of road sharing arrangements in the future. I’ve suggested making Yarra Boulevard a ‘Bicycle Road’ before but way back then I had something more elaborate in mind. This approach is simpler and cheaper. The impact on motorists would be minor. Yarra Boulevard is not heavily-trafficked and there are alternative routes. There is very little parking along the route – it’s mostly confined to the northern end around the Royal Talbot Rehabilitation Centre. There are only a handful of residents who access their properties from Yarra Boulevard. Residents might feel they would be better off if traffic were slowed. The big beneficiaries would of course be individual and family cyclists, especially those who live on both sides of the Yarra within (say) 10 km or so of the Boulevard. In addition, Melbourne’s profile as a good place to live and visit would be enhanced, as would the Baillieu Government’s standing with certain demographics it needs to court if it wants to stay in office over the long haul. Something like this proposal would also be a good starting point for improving the cycling environment in and around the CBD. It is indeed good news, but my take on Yarra Boulevard is to hand it over to cyclists completely and declare it a helmetless route. Bicycle boulevards for Melbourne (which I take are the same type as the US West Coast bicycle boulevards with the chevrons etc) should be made from a set of arterial residential streets, paralleling the main roads, throughout the metro area and making a grid. And yes 30km/hr and no on-street parking. I think 30km/hr limit across the entire metro area is an achievable objective. Sharing the road by getting rid of dedicated high speed car only lanes is common in Europe and starting in the US. Great idea Alan. Although having a quick look through the previous article on this idea I noticed you’ve said speed humps wouldn’t work because they would ruin cyclists enjoyment of the road. Why not install speed humps that have flat sections removed for cyclists to pass through? There are a few small streets in the inner northern suburbs that have something similar and it works well. Mainly I’m looking to keep it simple so as to minimise the arguments against the idea, either due to cost or opposition from motorists. Even so, I’d be worried about humps on Yarra Bvd. Wouldn’t they create a choke point for cyclists? Much of the appeal of this road for cycling is that it’s wide and fast. And to stop motorist using them wouldn’t they have to be at the edge? If so, that would defeat the purpose of the proposal. I don’t see any reason why you couldn’t have multiple gaps, providing they’re not a cars wheel base apart then the humps would still force cars to slow down. True cost might be a problem. I was simply trying to think of ways to overcome the 85/15 problem you described in the previous article. However after a good nights rest and clearer though patterns I think I agree that it’s probably best not to have any humps. The best way to slow cars down would be to make sure the road frequently has plenty of cyclists on it! Yarra Boulevard is wide, but it isn’t fast. It’s main charm is it has hills (good for training) and curves (scenic, fun). It isn’t fast because the council ruined the surface to prevent motor-cycles having their fun. Any speed-bumps/proposals would need to take into consideration, since a gap wide enough for a bike is probably wide enough for a motor-bike. A 30km/h speed limit may actually be problematic for cyclists too, given the serious users of that route average 35-40km/h and 50km/h+ down the hills. As someone said in your previous post, I’d prefer they fixed up the connecting points, and made it longer. If they resealed The Boulevard through Ivanhoe East (possibly the worst sealed road I have ever ridden on), and significantly improved/widened the bike-path from Chandler Highway to Bourke Road, cyclists could ride from Montmorency to Richmond (about 22km or the same as Beach Road). Extend the Copenhagen lanes. I cycle that route at least 2-3 times per week and the lanes never feels crowded. Separation of bikes feels a whole lot safer. I’d say it doesn’t feel crowded because virtually no one uses it southbound, only northbound. If it were used in both directions it’d be chockers. If extending it attracted new riders to the Boulevard then the problem would be worse. It’s too narrow, it would be expensive to build, and it would eliminate all parking.